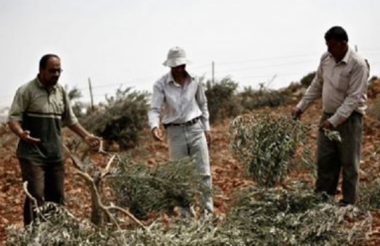 Several extremist Israeli colonists from Yitzhar illegal colony invaded, late on Thursday at night, Palestinian lands, south of the northern West Bank city of Nablus, and cut 20 olive trees. Ghassan Daghlas, a Palestinian official in charge of Israeli colonies file in northern West Bank, said the assailants came from Yitzhar illegal colony, which was built on illegally confiscated Palestinian lands, near Madama village, south of Nablus. He added that the illegal colonists cut twenty trees, owned by Qassem Najjar, in the al-Qa’dat area, south of Madama village. In related news, Israeli soldiers abducted, earlier Thursday, nine Palestinians, after invading and ransacking their homes, in several parts of the occupied West Bank, the Palestinian Prisoners’ Society (PPS) has reported.